Please welcome today's paranormal guest author Deborah Coates. Deborah is author of What Makes a River and Wide Open. Keep reading for a chance to win a print copy of Wide Open by Deborah Coates. Deborah: I didn't do much writing at all until after grad school and initially I concentrated on short stories. I wanted to try lots of different things and short stories were made for that. I wrote a mystery novel, set that aside because I didn't know how to fix it, had some more success with short stories and finally got the idea for WIDE OPEN a little over four years ago. Deborah: I love books with a strong sense of place and interesting complex characters. Writing about the paranormal lets me ground my stories in the contemporary world with characters who have recognizable life experiences, but then take all that and add a paranormal twist. What would people really do if our world had ghosts or sorcerers or ancient gods? I think the stronger and more solid the grounding, the more impact the paranormal elements have. I'm still working on how to do that, how different elements affect different characters and where particular stories lead. It's fun! Deborah: No contest. Immortality. Not only would I love the chance to read all the books and learn all the things, but to watch the world and the people in it grow and change, would be extraordinary. The long-term accumulation of wealth thing wouldn't be too shabby either. Deborah: What I hope is that readers will be drawn to the setting--western South Dakota on the prairie--and the characters. Hallie is sharp-edged and brave and a little bit reckless (ha!). Boyd is thoughtful and steadfast and at least as brave as Hallie. I write for character much of the time and I hope readers fall in love with these characters in this place and want to come along for the ride. EJ: If your book were being made into a movie, who would you cast in the leading roles? Why? Deborah: Oh, wow. I have clear pictures in my head of all of the characters, but I know that good actors can become their roles in pretty amazing ways so I'm not sure I can point to someone and say--that one, that person, looks just like Hallie or Boyd or Hallie's dad. I'd love to see actors cast who are the same age as my characters because so often actors age down for roles and then we picture people in their teens and twenties as looking older than they really are. But honestly, I'd love to see WIDE OPEN made into a movie. I'd love to see what they do with it, how it looks, and even what they change. Maybe it would be awful, but the flip side is--it could be amazing! To learn more about Deborah Coates and her books, please visit her website. 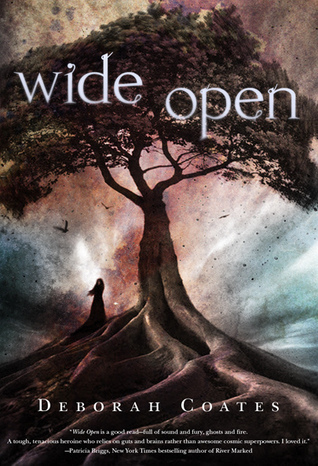 We are giving away a copy of Wide Open by Deborah Coates to one lucky winner! To enter, please leave a comment on this post and include your email address (so we may contact you if you win). This giveaway is open to US mailing addresses only. Giveaway ends March 29th midnight EST. Crazy beautiful Cover! Hope I win! This sounds like an amazing read! I am in all the way! Thank you for the invite. Sounds like an interesting book! I can't wait to read it! Intriguing book. I really want to read this. Thanks for the giveaway. 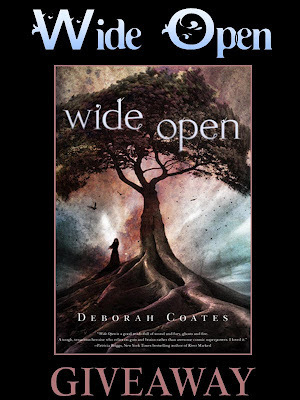 Deb Coates' Wide Open is a must-have for me. To begin with just look at that great cover painting. Bring it on, please. Love the cover! Thanks for the interview and the giveaway. Sounds like another book that i ned to read asap! I really wany to read this!! I reeaaallly want to read this!